With its distinctive horseshoe shape, Milos is the most southerly island in the Western Cyclades. It is notable for its volcanic soil and for the rich deposits of minerals that lie beneath. There are various kinds of beaches on Milos. Some of them are wonderful beaches with golden sand, and some of them have sharp rocks and caves that look like they have been taken out of some tale. 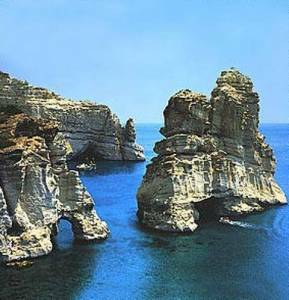 Any traveler going to Milos will surely be pleased with the sites of the island and its tourist infrastructure. Adamas, one of the safest natural harbors in the Aegean, is a particularly charming spot, with whitewashed houses, cobbled alleyways, balconies crammed with flowerpots, and fragrant tamarisks which have been extolled by poets. Plaka is the main town on the island. It is built on a rather flat valley and displays Cycladic arthitecture. On top of the hill, the ruins of a Frankish castle can be examined, and a beautiful view is available for those doing the 30-minute climb to the top. Inside the castle the church of Thalassistra is situated, which was built in the 13th century. Plaka also has a must-see cemetery (if you can call a cemetery a must-see!). The cemetery looks like a series of catacombs, where rich and poor are buried side-by-side. In the nearby Archaeological Museum, there is an exact copy of the sculpture of Afrodite of Milos (Venus de Milo) which was sent by the Museum of Louvre in Paris, as well as other finds from various periods. The Historical and Folklore Museum has a collection of folk artifacts, samples of the island's minerals, photographs, and historical documents of the greatest interest. This waterfront hotel offers an excellent position along the waterfront, within easy access of all restaurants, shops and services of the village. A short walk from the dock brings you to the hotel's entrance.